Home Safe is one of the latest works by bestselling and prolific novelist Elizabeth Berg . Recently widowed Helen Ames is a bestselling author who encounters writer's block as she tries to adjust to life without her husband, who took care of everything in the household, including finances. When Helen discovers there's very little money left for her to live comfortably from, it comes as quite a shock. Why are thousands of dollars missing and what did her husband spend it on? In addition, Helen must find a way to pay her bills now that her savings is gone and her writing is at a stand-still. What Helen soon learns about her husband's secret financial affairs will shake up her world, and the impact her story has on readers is not likely to be forgotten. Home Safe is by far the most memorable novel by Elizabeth Berg I've ever read, and I've read them all up to this point. Berg has the ability to provide naked insight into a character's mind and thoughts without making the character seem vulnerable, but beautiful and unique in all their diversity instead. 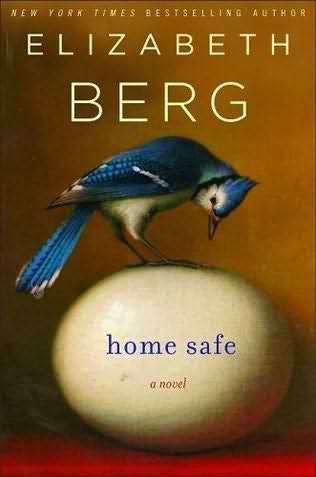 Home Safe is written in a way that will make you feel connected to the author because of its deep intimacy; you'll be intrigued as to how Helen's character is inspired if it isn't by Berg herself. For readers who truly enjoy the craft of reading and writing, you'll find yourselves strongly relating to Helen's character. Berg describes Helen as being a closet "people-watcher" to gain content and ideas for her books and scatters entertaining observations and anecdotes throughout; such as the fact that Helen enjoys the smell of dog paws because they smell deliciously like corn chips. Such tiny thoughts pop into our own heads and oftentimes we have nobody to share them with, just as it is with Helen. The cast of characters surrounding Helen in Home Safe are just as charming; including Helen's twenty-seven-year-old daughter Tessa and Helen's much-loving parents. One of my favorite parts of the novel is when Helen attempts to pick out clothes for her daughter (who happens to be the editor of a prominent beauty magazine); although Helen is convinced a particular sweater is stylish, Berg makes it perfectly clear to readers that it's clearly not stylish -- at least not for anyone under seventy years old! Home Safe has all the components that great literature is comprised of; including a genuinely surprising plot that will keep you guessing until the end. The ending definitely caught me off-guard, and this is just another reason why the novel is just grand. I highly recommend Home Safe to not only fans of Elizabeth Berg , but anyone who appreciates beautiful writing. Elizabeth Berg's most recent releases after Home Safe include The Last Time I Saw You (2010) and Once Upon a Time, There Was You , which is due to release in April 2011.